Stock chart volume is the number of shares traded during a given time period. Usually plotted as a histogram under a chart, volume represents the interest level in a stock. If a stock is trading on low volume, then there is not much interest in the stock. But, on the other hand, if a stock is trading on high volume, then there is a lot of interest in the stock. Volume simply tells us the emotional excitement (or lack thereof) in a stock. Stock chart volume also shows us the amount of liquidity in a stock. Liquidity just simply refers to how easily it is to get in and out of a stock. If a stock is trading on low volume, then there aren't many traders involved in the stock and it would be more difficult to find a trader to buy from or sell to. In this case, we would say that it is illiquid. If a stock is trading on high volume, then there are many traders involved in the stock and it would be easier to find a trader to buy from or sell to. In this case, we would say that it is liquid. A surge in volume can often signify the end of a trend. Here, on the left side of the chart, this stock begins to fall. Volume increases dramatically as more and more traders get nervous about the rapid decline of this stock. Eventually everyone piles in and the selling pressure ends. A reversal takes place. 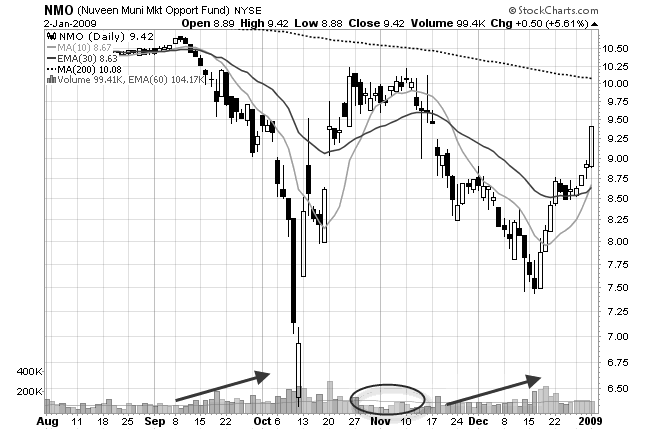 Then, in the middle of the chart, volume begins to taper off (circled) as traders begin to lose interest in this stock. There are no more buyers to push the stock higher. A reversal takes place. Then, on the right side of the chart, volume begins to increase again (second arrow) and another reversal takes place. 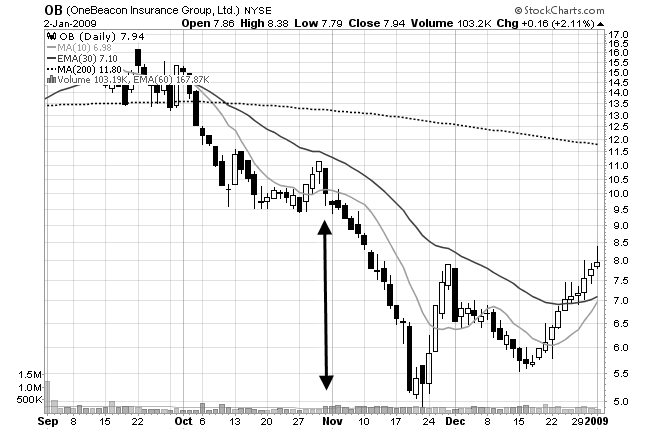 This chart is a good example of how the trend of a stock can reverse on high volume or low volume. Mistakenly, some traders think that stocks that are "up on high volume" means that there were more buyers than sellers, or stocks that are "down on high volume" means that there are more sellers than buyers. Wrong! Regardless if it is a high volume day or a low volume day there is still a buyer for every seller. You can't buy something unless someone is selling it to you and you can't sell something unless someone is buying it from you! Expansion of range and high volume - If a stock is drifting along sideways in a narrow range and all of sudden it breaks to the upside with an increase in range and volume, then we can conclude that there is increased interest in the stock and it will probably continue higher. Narrow range and high volume - If a stock has very high volume for today but the range is narrow then this is called churning. In this case, significant accumulation or distribution is taking place. Ever heard the saying, "volume precedes price"? Many times you will see volume pick up right before a significant move in a stock. You can see that interest is building. On a stock chart, look for volume to be higher than the previous day. This is a sign that there may be a significant move to come. This stock rallied for three days in a row on relatively low volume. Then, on the fourth day, volume increased dramatically. This increase in volume began the move to the downside. Interpreting volume on a stock chart can be confusing! Just remember that the price action is the most important factor on a chart.